HotForex's representative requests that anyone having issues please include the account number in the review. This should result in many issues being addressed more quickly. Hotforex is practicing unfair and scammy trading services to its clients. They manipulate their spreads that widen to more than 5 pips (during normal market conditions), contradicting their claims that they have the best spread service compared to other brokers as stated by their spreads comparison table in their website. They claim that most pairs have no more than 2 pips as shown in their table, but not true in current live trading. I have the screenshot proofs! STAY AWAY from this broker ..... !!! I have been trading with this broker since 2018. Withdrew many times and withdrawals are processed the same day or the next day (under 24 hours). This broker offers most of Forex trading services, CFDs or Bitcoin payment, Spread / No spread and Commission / No Commission. I think every trader can find their preferences here. So I highly recommend this broker for new or intermediate trader. I give them 4 stars! On 2019 Jan I started to make a list in my trading history dates to learn by myself from my mistakes to improve my trading. I had unexpected lesson in trading history at Hoforex. I wrote down about my trading story and complaints to man power in Syces on 2019 Mar 18 but I have not yet received their response. Traders please read my story in trading the past 10 months.. I have traded multiple brokers for years because I always diversified my funds. But after trading for 2 years, I see hotforex is much better than local brokers I tried. Another international brokers I was trading had the same quality but hotforex has a local IB that contacted me to support me any issue, it's reason I choose to keep trading with this broker. He has helped me a lot to withdraw / deposit my local bank account. Hotforex is quite popular in my region, South East Asia, with many offices. They offer various account options with minimal deposit from only $ 50. Highly recommend! I opened my account in October 2016. I provided a scanned copy of my ID card and personal bank statement for verification. After my account was validated I keep on demo account for quite some months before funding my live account. My live trading journey started a year later when I funded my micro account and started trading cable for sometime. My account was small but I made nice profits every week because of good leverage and lower spreads. Now I have two accounts with this broker, one is big one and another is the one I opened to start trading with them. I am trading with confidence because I have seen that the services are good. I withdraw my money back to my bank account most of the times and it's easy. Lahhotrid but hotforex representative who asked for account if, didn’t give his response, as i staes earlier, they think they have too big now to solve their clients issue, instead some other people are contacting me and telling they have the same issues, anywaYs lets wait and see. Well, Well, Well, here we go again, I never thought that I would write review about hotforex again after 4 years but things are getting worst with them. I had account with hotforex 4 years back and when I started to make money, I faced all above issues, after reviewing it on forexpeacearmy, they resolved some of the issue, but my relationship with hotforex ended with some of the continuous issue, changing instrument timing without informing clients etc. I opened account again due to personal relation with their Manager Mr. Sohail Khan( who also resigned due to issues with hotforex) who promised me that there would be no issues and my account will directly be connected to market and there is no B Booking involved, if some of you don’t know what B booking is, its market making, they trade against you rather than sending your trades to markets. Last weekend they stop hunted me on 2 of my positions with sudden spike and after that price went to normal. I have deposited more than 10k usd in last 2 months, but greed is curse and they just stop hunted me for 216 usd. I sent them email immediately and there was no reply from them when market was open and they most probably enjoying their beers. I would say that’s an arrogant behavior. After multiple emails, they took more than 16 working hours to solve the issue. Their trading desk is pathetic and they opened and closed my positions multiple times, they can’t even understand simple math, how to add and subtract. But big question is that how an ECN broker can change positions when time has passed, only a market maker can do that. There was also a weekend between this and those 2-3 days was full of mental stress and tension for me but they don’t care, because they think that they have grown too big to provide good customer support to their clients and resolve their issues. They opened my positions again when market was against me, if they would have stored it earlier, I would have made good money, but why they should have done it, they don’t want you to succeed. In the end after multiple emails, they reimbursed me 216 usd after I sent email to their MD, Mr. Aristos. so I started to trade again. Then one fine morning, I received email from their client audit team that they are closing my account under clause 35.2 , that clause just say that they can close account, nothing else, and I won’t able to open any new positions, that day I lost many opportunities to make money, we need to understand that leverage trading is big risk and reward, so they have deprived me opportunities to trade in the open market. Giving trading opportunities to the clients should be the first and foremost objective of the broker but they have denied me that opportunity. I tried to contact all known people in hotforex but there was no reply till today from them, why they were closing my account. I have caught them red handed for stop hunting me, that’s the only reason I think, they have decided to close my account. They would have thought this client will keep an eye on us and will catch us again. As I mentioned earlier that greed is curse, my trade volume is very high, even if they would have just relied on commission, it would be a lot for them but no, they want to rip you off each and every penny of you. So guys, making and losing money is part of business but if you don’t want to have mental stress, tension, wastage of time and want to avoid pathetic customer service, avoid this broker, they are scam. They will stop hunt you, there will be execution issues, because they are market maker, they will never want you to make money. I have proof of each and everything which I stated above and if anyone is interested, they can contact me to see the proof, I can’t post snapshot here. I will show how they are stop hunting with spiking the price, how they are changing positons without informing clients. Yesterday I sent them an email and I gave them a fair chance to resolve the issues and was expecting call from their management but they opted to ignore. Hotforex is a bucket shop, market maker, they will rip you each and every penny of you. I will also send this review to them and ask them to defend it on forexpeacearmy as I continue to give them a chance to step forward and communicate with me. HOTFOREX IS A CERTIFIED SCAMMER... STAY AWAY AS FAR AS YOU CAN FROM THIS BROKER. THEY DO IMPOSSIBLE THINGS TO KEEP YOUR MONEY. THEY DO NOT EXPECT YOU TO DO WITHDRAWALS. Details: In my previous review, the withdrawal finally registered in my account after 15 days. But the impossible thing happen, HOTFOREX TOOK IT BACK FROM MY BANK ACCOUNT! YES ITS IN MY BANK ACCOUNT ALREADY AND HOTFOREX REVERSED IT! I was assured by its country representative that its impossible to do but they actually did it. ITS VERY SCARY BECAUSE THEY CAN TAKE BACK WHAT THEY DEPOSITED. Imagine the implication of what they are doing. Trade with Hotforex at your own risk. I already got my money. Their country manager took an effort to call twice to make sure I got it already. I also talked to my bank. The issue lies in the intermediary of Hotforex. Hotforex may have processed it quickly but the intermediary is very slow. Advised them to address that. Great customer service. I hope they would fix their intermediary issue. I wish I could take the initial post down to give them a chance but system won't allow it. Hopefully this explanation will help. Hotforex is a black hole broker. They do not expect you to profit so wire transfer would take forever. It is now 2 weeks and I still don't have my money. They would give a bogus ARN number which is useless when you talk to your bank's remittance department because no money was actually sent. It happened to me twice. I gave them the benefit of the doubt the first time and it happened again. It is already their business practice. You will not realize the problem until you withdraw money. Once you withdraw, that is time they will give you a merry go around where you could get your money after a month (assuming you could still get it). This company has a thick face. Soooo difficuuuuuuult to ask for withdrawal. Its been 17 days already and they still haven't deposited it yet. Stating a lot of excuses. The amount is not even much. The worst part is that if you are going to follow up for their failure to process withdrawal, they will ask for your bank statements and a lot of documents. INconveniencing us for their incompetence as a company. It is very likely that they do not expect us to withdraw money after we deposited. This company is a blackhole of our money or Hotel California of deposits. Once you have deposited, it will be extremely difficult to withdraw. + Reputable broker, I know this broker for a long time at Forum also Social Media. I did register a demo account there and someone from EU called me for consulting me opening live account there. + Multiple accounts and assets for trading. 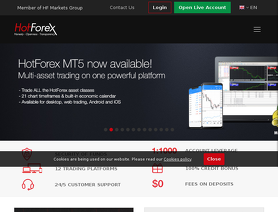 Hotforex supports both MT4 and MT5 platform and you can trade Forex and CFDs, Bonds, Stocks,... I tried several broker before and their services are not various like hotforex. + Fast payment: I used Skrill/Neteller and CC for deposit and withdraw. Both are good to use at this broker, you normally have your fund credited within a few mins and withdraw within 24 hours without any hassles. + They offer many things and as a beginner, it's not easy to pick a right thing for you at the beginning. I at first prefer Zero account for tight spreads but then I turned out switching to Premium for 0 commission. + Slippage during volatile time, it's common at most brokers but it should be considered if you're FA trader. This is my secondary broker that I am testing for consecutive three months. I have a micro account with small amount. The trading software has multiple options to enter points where the trades automatically initiates and upon reaching the desired take profit input, trades are closed with no hassles. I had withdrawn only once and it was processed easily. So I am considering their services and continue trading for more time. Once I get more confidence and money then I will permanently shift my business to this broker as my primary.